The DYNAMIK Komfort Elite Pro system is a low profile sprung area elastic sports floor system. It is designed to be laid on a level slab (+/- 3mm over 3m) and incorporates a high performance hardwood engineered board. The system is ideally suited to take high loadings and is FIBA approved. The system consists of a high density elastic layer over which a load distribution board is installed prior to the hardwood engineered board playing surface. As every part of the surface is equally supported by the elastic layer, consistent sports performance is guaranteed. 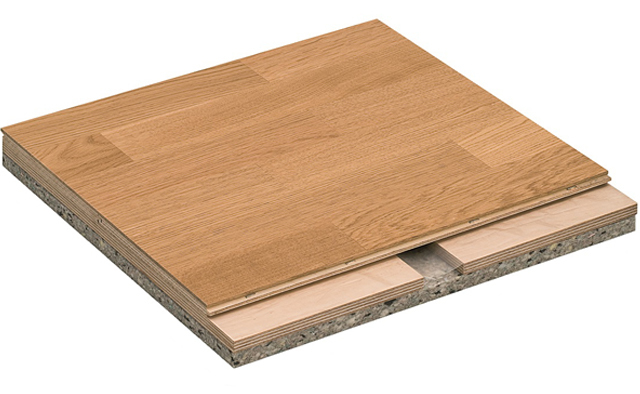 The Komfort Elite Pro system is manufactured to combine a solid hardwood wear layer with a high density multi-layer plywood core. The high density multi-layer core provides superior indentation resistance and high dimensional stability.